The past shapes the future and crafts the present. Whether we fill our homes with cherished memories of the past in the form of photographs, family heirlooms of textile, clay, glass, or wood, or we hunt antique and second-hand shops in search of other’s memories of the past, our yesterday is a powerful force. It can be the beginning of a dream we are finally able to realize and become our present and future. Such is the story of Brian Ellis. Brian Ellis wanted to own his own club where he could play his music and the music of others that he had admired all his life. That dream was realized 3 years ago. When he turned 49, the building he had dreamed about owning once again became available. The building in question was built as a bingo hall and turned into a church. Then Brian got the call from Portia Lewis, whose family had owned the building, that it was for sale. She asked if he was still interested. Of course, he was. Not only was she willing to sell, but she promised to help in any way she could with the purchase. On February 15th of that year, Brian’s wife died of cancer. Her illness had slowed the progress of work on the club but only deferred the dream, not denying it. There was no problem in choosing a name for the club. It was Brian’s, he was 49, it was located on highway 49. Brian’s Club 49 was born. Brian has loved music all his life and what a life it has been. Losing his parents when he was a child, he lived with his grandmother here in Roxboro. When she passed away, it was a succession of other relatives, an orphanage, and foster homes. The one constant for Brian during this part of his life was music. His music career started at the tender age of 15. A band scheduled to play at Big Daddy’s Country Club was one short. Band members knew what a talented musician Brian was so they snuck him in to play. No one ever knew he was only 15. Several years later he started playing with a band at the Carolina Country Club in Ruffin, North Carolina. He stayed a part of the band and the club for the next 15 years. Becoming an accomplished musician and singer over these years, he began planning his own band. Brian’s dream of his own band was realized long before the club. So, he and the band played at many different venues. 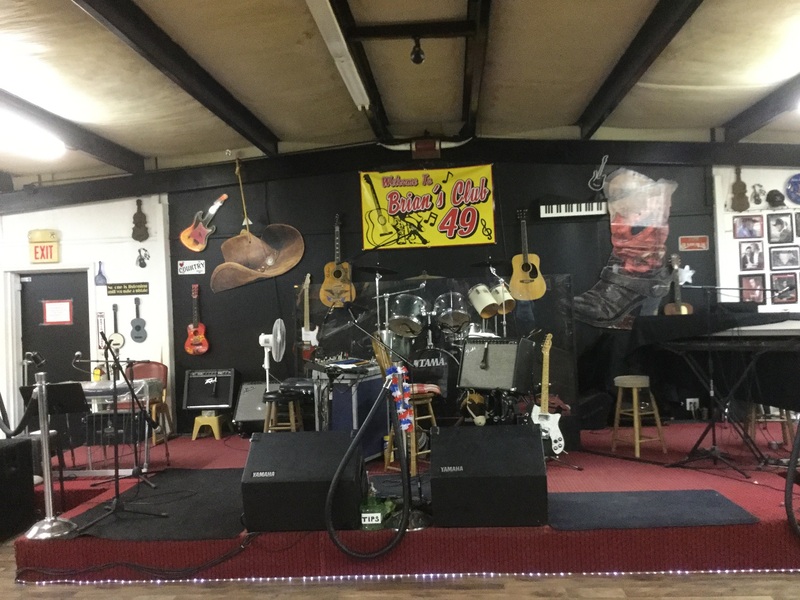 Prior to Brian’s Club 49, he ran South Boston 360 Dance Club where his band also performed. 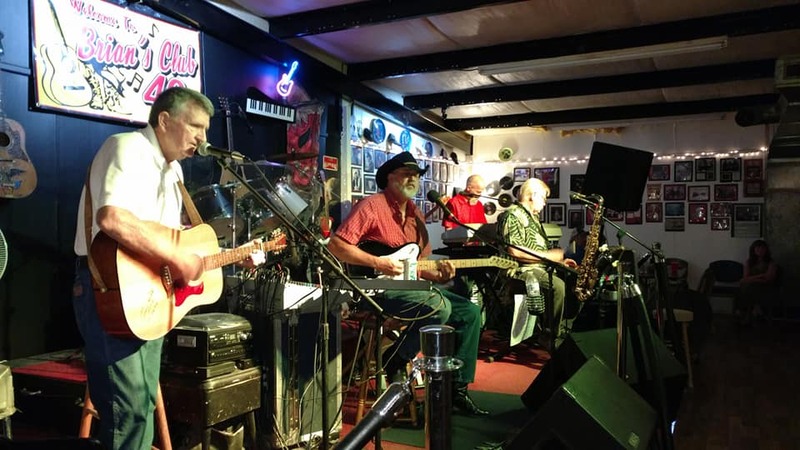 Now along with Andy Grissom, keyboards; Richie Hammond, steel guitar; Dennis Howell, bass; Sonny Edwards, saxophone; Cootie Edwards, drummer with Brian being lead guitar and vocalist the Brian Ellis Real Country Band has a permanent home. And for Brian, another dream come true in what he feels to be his hometown. Home is a good way to describe the feeling of Brian’s Club 49. It is a comfortable place. When you enter there is a sofa and two chairs just like you would find in anybody’s living room or den inviting one to sit and chat. Two long rows of tables extend toward the stage which is just opposite the front entrance. It looks like family style seating, which is an apt description as this is a family style club. Right away the chairs at these tables catch the eye. No folding or wooden country chairs here, but chairs with cushioned seats and backs that gently rock when you sit in them. Most all of them are blue, Duke blue, as that is where they originally were, except for some motely looking green ones. It was the green chairs that helped convince John Anderson, one of Brian’s lifelong idols, to come play his club. Anderson asked for photos of the proposed venue as was his habit. Brian sent the pictures including some of the motely green chairs. Anderson immediately responded he would indeed come play. He mistook the chairs for camouflage and being an avid hunter decided it was his kind of place. Anderson was a big hit and so were the chairs which conveniently found their way to the front rows furthering the illusion. All ages are welcomed at Brian’s Club 49. On Friday nights, performers from 9 to 90 sing karaoke and Saturday night is for dancing. But it is not just a dance, it is much more. Two long tables against the wall are for the food. Seems that somehow Saturday night has also turned into one big pot-luck dinner. 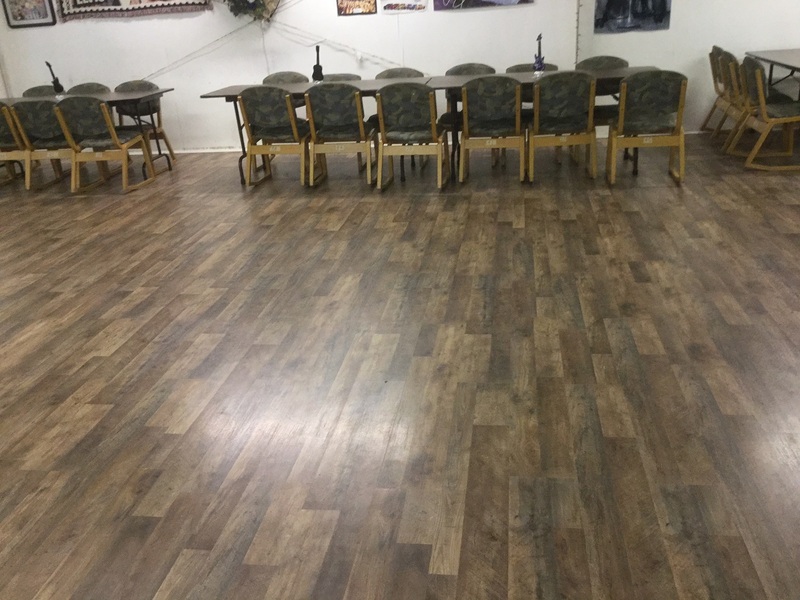 Barbecue, fried chicken, salads, pies, cakes and more fill these tables for everyone to enjoy. Anyone attending the dance is invited to partake, and many have become regulars. 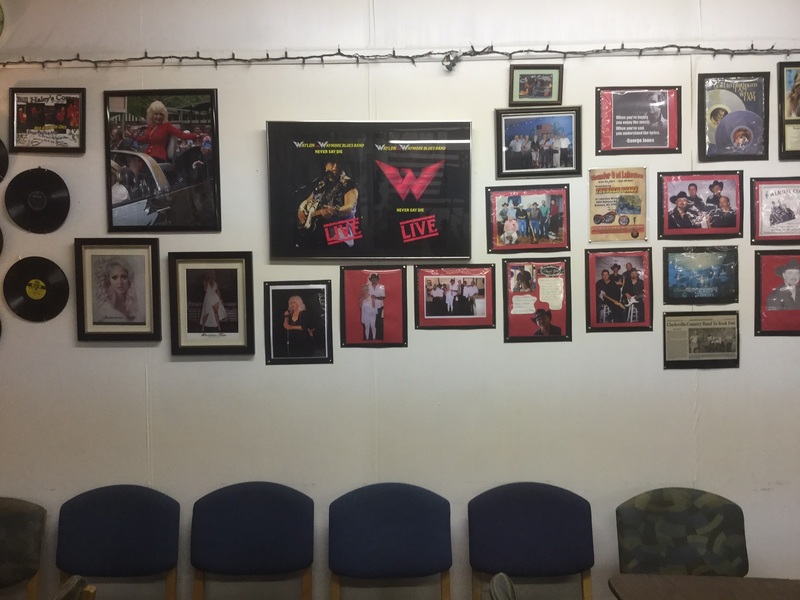 Lining the walls of the club are photos like you might find in any home. 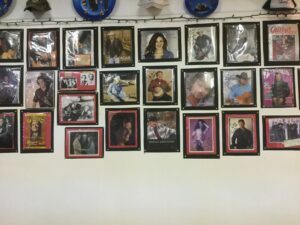 Not just family photos, but autographed photos of practically everyone who has been someone in country music. 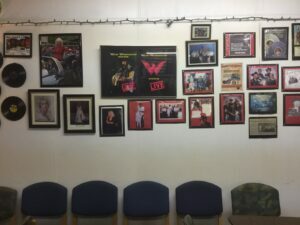 Plus, there is a lot of Elvis on the walls. But it all adds up. Brian became acquainted with longtime Elvis band member and real discoverer of Elvis, Scotty Davis. 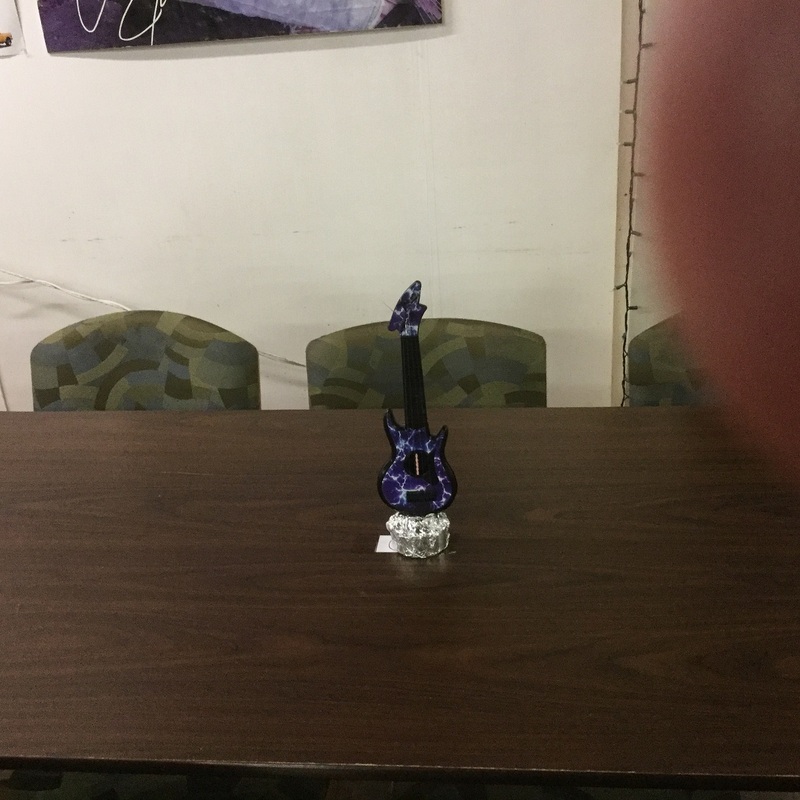 Through him, Brian has a guitar pick signed by Elvis, another signed by Davis, and an autographed copy of Scotty’s book about his time with Elvis. When Brian Ellis talks about his life, his music, his club, and his band, it is easy to feel his passion, it’s infectious. For example, a while back one of the regulars asked to make an announcement. Brian agreed, the guy stepped to the mic and requested that folks that could, please donate money for a wooden dance floor. Seems dancing on concrete was hard on the legs. The man then offered to match all donations. By the end of the night a little more than $500 lay on the stage. After the club was almost empty, an older regular approached Brian, pulled $1000 from his pocket, and demanded, “Now call him back and tell him to match that.” Brian did, he did! After trips to three different Home Depots and help from friends including the two large donors, there was a new dance floor in place before the next weekend. Then there was the time when Brian’s dedication and passion for music almost cost him his life. While playing at the Kirby for Demetriss Tapp, a Person County girl who made it good in Nashville, Brian had a heart attack. He was rushed to the local hospital and then Life Flighted to Duke. All the while telling everyone he had to go and finish playing for Demetriss. He was more concerned about the music and the show than his health. 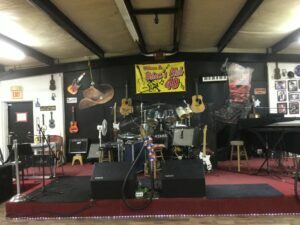 Brian’s Club 49 is located just outside of Roxboro on Highway 49 south. 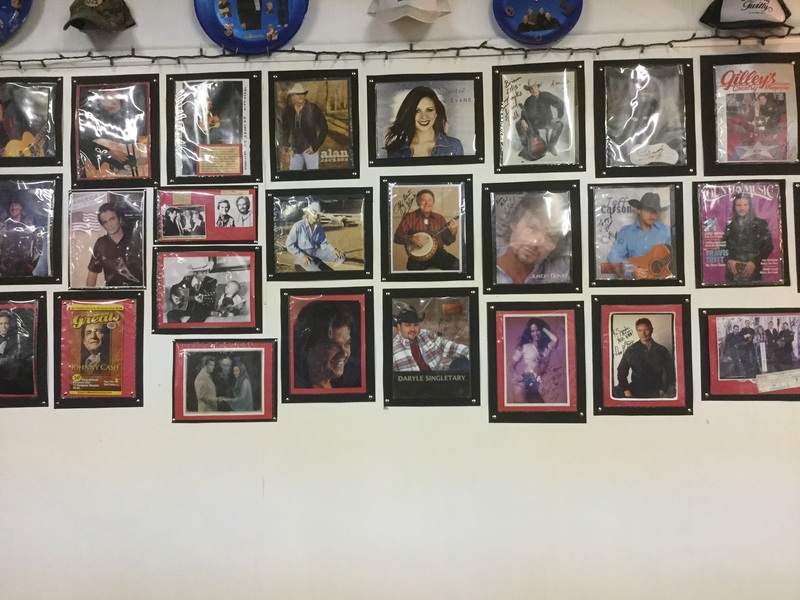 The address and phone number are 495 Burlington Rd, Roxboro, NC 27573, (336) 597-5601. Check out Brian’s Club Facebook page or better yet plan a visit to the club one Friday or Saturday night.